Conversations a dying mother has with her three daughters allows each of them to make a crucial decision they seem to have been avoiding in Little Sparrows, a love letter to mother / daughter relationships. An ordinary film about this subject would be sentimental and soapy, and while Little Sparrows isn’t trying to accomplish anything new in terms of storytelling or cinema, it is an entertaining and very insightful take on this material. Susan is the matriarch of a small but loving family. Her husband James is an actor, always has been away from his family, and much of the love centers around Susan, Nina, her eldest daughter, herself a widow with two children, Anna, an actress married to a film director, and Christie, the youngest, enrolled in medical school. The film unfolds in confessionals and each daughter is given her own chapter in this three-act piece. First is Anna, who is having an affair. Her husband seems a decent enough guy, though at an awkward moment during their last Christmas together, James asks Mark why he hasn’t given his daughter a part in a film. James warns him that Anna might be unhappy and indeed she may be. The film got off to a mediocre start because Anna’s story isn’t original nor is it interesting. The caliber of the acting constantly saves this film from going under, so I stuck with it. Christine we follow next. Her story isn’t that original either but director Yu-Hsiu Camille Chen makes some very refreshing story developments. Christie is a lesbian, a fact she has decided from a very young age to keep to herself —the result of an embarrassing and private incident with another girl. With the certain death of her mom and the pressure of keeping her girlfriend a secret I suppose, Christie tells her mom and Susan is happy that her daughter has someone who loves her. Coming out stories often focus on the horrible things that parents sometimes do when learning the truth, or at least being confronted with the truth because parents always know. But the key word is sometimes, and it is often the fears of the kid that prevent them from admitting or confiding in their parents. The reality sometimes isn’t that scary. That Susan is not fazed and that she holds her daughter in bed afterwards and caresses her skin was the perfect choice for director Chen to make. Arielle Gray looks great in this part. She’s probably the best looking lesbian I’ve seen in a movie, and I’m not making a joke. In movies lesbians are either smoking hot or really butch. It’s one extreme or another, and Gray looks like a normal kid. She dresses fine and indeed seems to have a knack for fashion and decoration, her hair and makeup are minimal and feminine and her physique is like any realistic 20-something college girl. 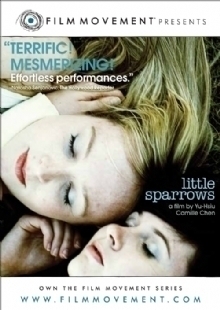 Maybe being mostly confined to American depictions of lesbians, who often suffer more in the media than gay men, I am more impressed with this aspect of Little Sparrows than I should be but I was all the same. Nina, the oldest daughter’s story, really fascinated me. More than her siblings she has been connected with death. Her husband died at a time when she was thinking of leaving him; their children were small, and now she has raised two happy kids. Nina is her mother’s confidant and best friend, Susan confesses her own bit of guilt and admits that now at the end of her life she doesn’t yet know if it was the right decision. She tells her daughter to remember to take care of herself. Nina had recently run into an old friend of her dead husband’s, who we sense she has mourned terribly regardless of their marital troubles, but Nina’s closed-off emotions are preventing her from perusing a relationship. Susan’s words force each of the girls to make a drastic change. In Nina’s case it opens an opportunity for future happiness. The great thing about the film is that we never see anything beyond Nina asking the man out. Their relationship is left for us to discuss. Christie’s talk with her mom literally changes her life. Relieved of the burden of her secret, she moves in with her girlfriend, leaving her dad all alone. Things don’t quite work out for Anna. Anna, though, is in a very difficult stage in her life, but who never is? Anna’s lover has broken off their relationship which pains her. Susan senses something wrong and tells her daughter to know what to value in life. She now does, and Anna goes back to her husband, confesses her infidelity and he leaves her. In the end, Anna and her father, robbed of his youngest and his wife, find each other in the end. Little Sparrows might not be unique, but it is insightful enough to know that there are no perfect scenarios. Christie’s happiness, for example, pains her father, though it is unintentional, and he is not selfish enough to stop her. Nina’s reaching for happiness forces her to go outside her comfort zone which is never pleasant. But even when life is cruel opportunities still remain, and it is up to us to identify them. The film doesn’t linger on the death scenes. The only sappy moments exist in the setting and dialogue between mother and each of the daughters—the hospital talks full of wisdom. Great credit to actress Nicola Bartlett, who plays Susan. Bartlett has few screen credits and hopefully Little Sparrows launches her career because she is terrific. Even in those soapy exchanges her demeanor and focus weigh down the ludicrousness of what her character is saying. True as the words might be, it is predictable that she’s saying them at the end of her life. I often wonder why movie characters gain so much wisdom when facing death. I also wonder why this kind of film always gets made. It must be that the death of a parent, for those of us lucky enough to have loving parents, is so moving that filmmakers often feel compelled to tell their stories. What a paradox! That they are financed and produced often enough shows that it’s not only artists who are sentimental. A good companion film to this is a French / Canadian romantic comedy, The 3 Little Pigs. It is about three brothers meeting with the death of their mother. In addition to depicting the differences between men and women, and for that matter the similarities, these two films are unique and very enjoyable takes on some very familiar material. I studied film at the New England Institute of Art in Brookline, MA, and received a BS in Digital Filmmaking. I was awarded the college's first ever "Excellence in Screenwriting" award upon graduation, and have been invited back as guest lecturer in many screenwriting courses. I've directed a short film, BEST PERFORMANCE, based on one of my scripts. I am currently studying at the American Film Institute Conservatory as a Screenwriting Fellow, and am working on several feature-length screenplays both inside and outside of my classwork.